Homesteading is not easy. It’s incredibly more difficult when there is only one set of hands to get work done. I’m fortunate to have a partner who has a common interest in animals and growing things. She’s done most of the work on this homestead while I’ve been away at work. Sometimes, our partnership works so well that I forget about the different needs that we have, different ways of finding fulfillment. This has to be the case with any kind of partnership. We need to keep an eye out for the needs of those around us. I got a reminder today. While I was blogging about the dollars and cents approach to raising piglets, the wife was doing her thing. 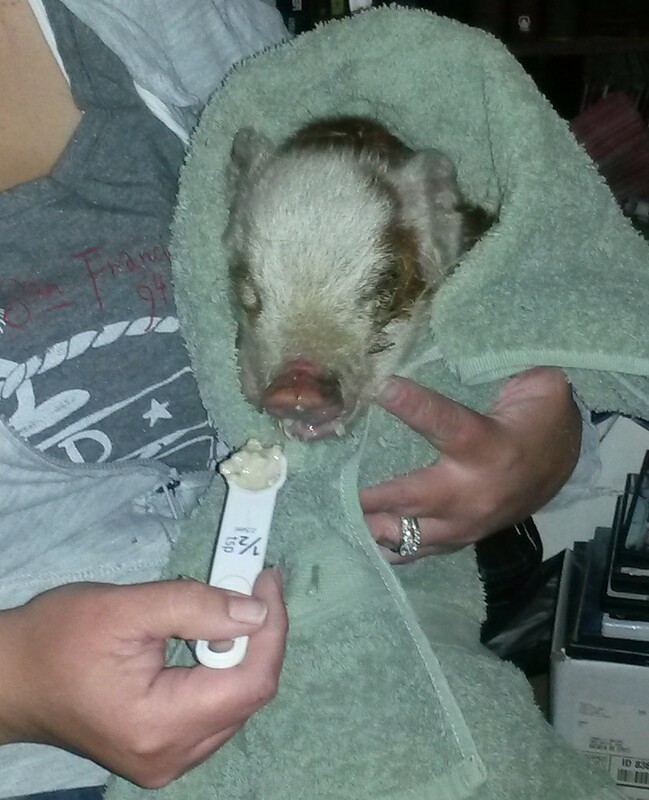 She was bottle feeding a piglet cradled in one arm with a sleepy kitten cradled in her other arm. I was missing the point in my earlier blog. This thing we’re building isn’t about my definition of success. It’s about her definition as well. This means that she’s going to put more effort into an ailing animal. She’s going to love on her baby critters. They’re all going to get names. They’re all going to get sweet talk and treats. That’s what she’s about. There’s a YouTube video about a pig with hind issues. Someone built him a cart and the video shows him getting around. My thought was, “what a waste”. The wife thought differently. I’m pretty dim sometimes, but I realized something. To be that way would be hard work for me. It’s a lot of effort for me to project and emote that much. For the wife, it’s something she has to do, just like breathing. Sometimes, I need to get out of the way, or just shut up and let others savor their moment. I wish I was better at recognizing when to do that. Right now, the wife has that piglet on her lap, spooning oatmeal into the poor little thing. She has that pig swaddled in a towel and is crooning. Somehow, I’m enjoying the moment as well, watching her. I’m preaching to the man in the mirror as well as to anyone reading this. I don’t have relationship stuff down. 1. Stop doing damage. Don’t demand, don’t yell and stop stepping on someone else s’ dreams. Don’t expect instant recognition when you start fixing this. Don’t do it a few times and give up. This isn’t about what someone else is going to do for you, it’s about you learning to be a better person. 2. Just shut up. Observe. See where you can help. Don’t get hurt when your help isn’t wanted. Don’t expect a reward for trying. This isn’t a trade. This is about being worth the oxygen you breathe. 3. Do one nice thing a day that won’t be noticed. This is a way of saying, “I respect you”. If you’re poor at it, you’re really just using the other person. These things that you do are never going to come up in your conversation. You will not be rewarded for doing them. 4. Realize that you’re never going to get all the credit you deserve. No one can look into your heart/head and see your noble intent, understand what you really meant, etc. At the same time, be happy that they can’t see the depth of your selfishness. If you’re honest, you can find a dozen different ways that you are a jerk to those around you. 5. Say “thanks” and “I’m sorry”. Mean it when you say it. No excuses. Own up when you’re at fault. Don’t blow up when life is unfair. 6. Find reasons to compliment. Don’t get mad when you’re treated with suspicion. Be truthful in your compliments. 7. Know when to let go. Sometimes, a relationship is too far gone. Either you’ve done too much damage or the other person is damaging you or those you care about. Sometimes goals don’t match. 8. Find stuff to appreciate every day. I’m not talking about other people. Be thankful for what you have. Stop griping as well. 9. Find stuff that you’re good at. Know you can accomplish stuff. Be confident. Be confident quietly. 10. Self-examine. Look for ways to be a better person. 11. Examine others. Look for ways to help them succeed. Hopefully we’ll all get to be better people! Awesome post Dude. I guess it takes a headstrong person to go against the grain and take up homesteading (hence the reason I’m here also). I think the points you have made make you not only qualified but an expert in the field. Jeremey and Charity, I just read all of your April posts — it’s where I left off the last time I checked in. I can’t keep up with all ya’ll are doing over there! It is amazing and I can’t wait to see. Right now I’m emailing Bob the link to your blog so he can sit and read from his computer what’s going on at the Homestead. He’s going to love it! Right now he’s out back building framing to go up on our back porch so he can screen it in giving our kitty a way to be outside without the dangers of city life all around us. His first project since back surgery! I’ve tried not to mother hen him today but I surely don’t want him overdoing it either. Love you guys and can’t wait to see you and the Homestead. As I had a sweet piglet in my arms yesterday, typing a response was difficult. Let me just say that I love my husband. I love that he’s the kind of man that wants to be a better man. That he encourages, and successes are rewarded. Failures are seen as learning experiences. I’ve never felt so loved and appreciated. Sadly, sweet Fat Patricia passed away in my arms this morning. I will be blogging about it from my viewpoint…if I can dry my eyes long enough to see the screen. This is so beautifully written! Easily one of my favorite posts of yours!